An Ojibwa man wearing a feather war bonnet, leather vest, arm band, fringed buckskin leggings, moccasins and ankle bells dances on a platform for spectators. Two Ojibwe children are sitting in the corner of the ring. WUWM's Race & Ethnicity reporter Teran Powell talks with the author of the Ojibwe Traditions coloring book series. "It was hard. It was like watching all of your non-native classmates go through school and have this big success story written for them already when us native students were given only a pen and no paper to tell our story with," she says. One of the books in Cassie Brown's Ojibwe Traditions series. Brown says while more than half the students were Native American, much of the faculty was not. "We had one, maybe two teacher’s aides or teacher’s assistants that were native, but other than that there weren’t really any native teachers there for us. There wasn’t even really like resources up on the walls depicting native people, or really anything like that." Today, Brown works at the University of Wisconsin-Superior, where she's the coordinator for equity, diversity and inclusion for multicultural programs. She has degrees in outdoor education and Native American studies from Northland College in Ashland, Wis.
During her time at Northland, she says she learned there's still a shortage in classroom materials designed for Native American children. "I worked in the Indigenous Cultures Center there and everywhere my boss and I traveled for outreach and to native educator conferences, all we kept hearing was that there weren’t culturally responsive teaching materials for native students that were easy for non-native teachers to use." 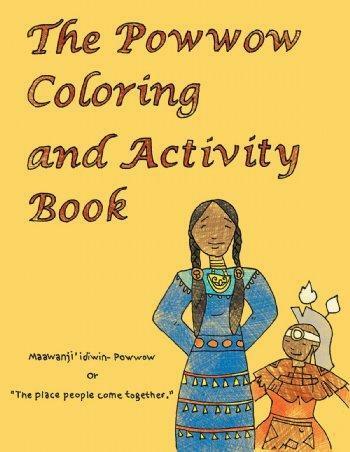 Yet Brown says, at first, she didn't plan to create a coloring books series about Ojibwe traditions. Rather, the project began with just one book, which she wrote when a friend asked for help. "My buddy Jerry, who ran our community maple sugar camp back home, called me up one day and he was like, 'Hey, can you create this coloring book that kids can use when they come out to camp to learn the process of maple sugaring?' So, I began creating the Sugarbush Coloring Book," she explains. Brown got a publisher and followed up with volumes on storytelling, wild ricing and powwows. Her drawings in the books depict Ojibwe traditional practices and teachings. For instance, they all include the seven grandfather teachings, which she says promote the core values of being a good human. Brown explains why she chose to create a coloring book instead of a children's storybook: "With all of the language and activity pages in the coloring book, it allows the students to choose whether they’re engaged or not, but it also allows teachers to pick that up and the students can actually be doing something while learning instead of just listening and looking at pictures." Initially, she was nervous that the books wouldn't do well. But she's heard positive responses to the series from teachers and students — something that makes her proud. "Being able to split the narrative and have these resources for students now makes me really happy that I was able to help do that. And to help our native students be proud of who they are and be proud to speak their language or take pride in learning their culture and their lifeways and not have to do it in secret or not have to do it just at home," she says. So far, her books have mainly been used in schools. But they can be purchased through the Wisconsin Historical Society Press and other vendors. She hopes they appeal to kids and adults and plans to keep adding to the Ojibwe Traditions series. When Milwaukeeans hear the name Solomon Juneau it likely rings a few bells. He was a founding father of Milwaukee and the city's first mayor. However, Juneau’s name also belongs to a tugboat docked year-round near the Michigan Street bridge downtown.